Wedding bands or wedding rings as you would like to call them are symbolism of everlasting love. Worn on the left ring finger, the only finger with a vein that connects to the heart makes this bond and union extra sweet and special. 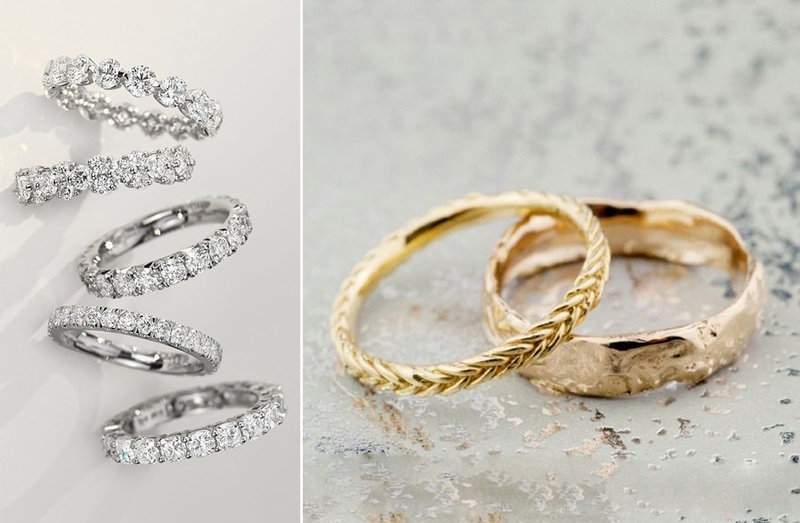 When it comes to choosing wedding bands why go for the plain Jane gold or platinum ring. A simple ring is always a safe bet and cost-effective too, but c’mon it your everlasting piece of love, not just mere jewellery. Spending a little more on an exquisite piece that will be with you for a lifetime and perhaps become an heirloom charm shouldn’t hurt. Play with textures, go dual toned or layered, the options are endless. With assortment of styles and incredible craftsmanship available in the market, it’s time to take the plunge and experiment. Of course, personal choice needs to be taken into consideration. After all, not all individuals are the same just like the fingers on our hands. While some couples may like it chic, simple and traditional, some prefer engraved, embellished and bold pieces. To suit any and every type of wedding band choices for couples, this week we present to you these 10 strikingly unique wedding band ideas that are sure to make even the couples who like it traditional rethink their considerations. Look, look! Mark your print on your wedding bands. With jewellers these days using high-tech ways of creating customized pieces of jewellery, having your print on your eternal love pieces is now just a thumb away. What better way to commit to one and other by carrying your loved ones heartbeat rhythm with you wherever you go, right?! These are not just random heartbeats shaped on rings, an actual ECG monitor is used to trace your heartbeat and have it exactly shaped onto your wedding bands. Check out more wedding ring ideas on what’s hot and trending here.